When the payrolls number came out on Thursday morning, the market was taken by surprise. The sell-off in the equity markets was reminiscent of the poundings the market was taking early in the year. The data hurt US and European equities, put pressure on commodity prices, while government bonds, the yen and the dollar were boosted by the rise in risk aversion. "If you were banking on the US driving a vigorous recovery, think again," said Alan Ruskin, strategist at RBS Securities. The larger-than-expected 467,000 decline in June payroll employment and the rise in the unemployment rate from 9.4 per cent to 9.5 per cent, poured cold water on hopes that the US was poised for recovery. But this really should not have been a surprise. Jobs changes in the US are now driven by construction. 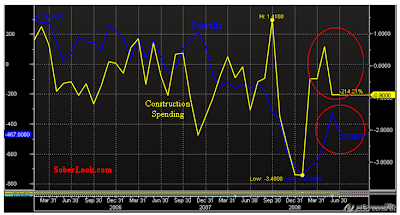 Construction spending data a day earlier showed a 0.9% decline, which translated in nearly half a million jobs lost. Mass media is not reporting on this relationship for some reason, but that shouldn't be a surprise either. Housing recovery will be key to any significant economic improvements, just as it's decline had led to the recession.